Hair butters (particularly, shea butter) are like a godsend to a coily girl! Not only do they add moisture to dry hair, they’ll also moisturize and protect your scalp. Call it a two-for-one deal, but several coily girls have shared that they don’t know what they’d do without their hair butter! As with many products for our hair, there are pros as well as cons to using mass-produced hair butters. Did you know that you could make your own homemade hair butter and control not only what goes into it but also the quantity of each ingredient? Why not try making your own hair butter? Probably the most well known ingredient in most hair butters is shea butter. What is shea butter? 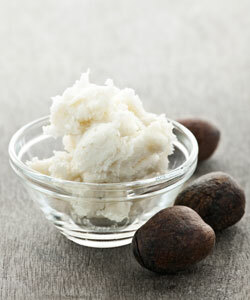 It’s a fat that comes from the shea tree and that is great for moisturizing. For that reason, you’ll find it in many cosmetics and hair-care products, as well as body lotions and hand creams. Additionally, it can soothe wounds and help cover unsightly scars. Oddly enough, it’s also edible and is an ingredient in some African foods and sometimes chocolate! Thankfully, making hair butter is nowhere near as time-consuming and strenuous as making real butter! When purchasing hair butter isn’t an option (or preferred), try making your own with this recipe. For this recipe, you’ll need a double boiler as well as a rubber spatula to scrape the shea butter and coconut oil out well. Use about one cup of each and pour them into a double boiler, then let them melt slightly. Once they’ve melted some (but not completely), let the mixture solidify and then pour the mixture into a mixing bowl. At this point, you can add in any essential oils you might like for scent, such as peppermint, lavender or tea tree. If you do add any essential oils, use just a few drops of each. This is optional, though some curlies have found benefits from specific oils. Blend the mixture together until it’s very smooth (some curlies prefer to actually whip it), then use a spatula to transfer your hair butter into a mason jar with a lid. This recipe is what we like to call a “basic” recipe. That’s because some curlies prefer to use olive oil instead of coconut oil, whereas others like adding in some cornstarch to thicken the mixture some. Still others like adding in about a teaspoon of jojoba oil. Whatever the case, you really have a lot of freedom to add whatever great oils you’ve found work well with your hair to this basic recipe. Do have a recipe for a moisturizing hair butter that your curls love?